These bouncy pincushions take "stick and move" to a whole new level. Look out when they turn red with rage! The Pricklemane is a Dream Eater that appears in Kingdom Hearts 3D: Dream Drop Distance. The Pricklemane is a small, hairy lion-like creature consisting of a head with feet and a tail. Its shape is a circle, covered with prickles. Hari (針?) is the Japanese word for needle, possibly referring to its "prickles," which are usually needle shaped. In the North American version of Kingdom Hearts 3D: Dream Drop Distance, the Pricklemane's name is triggered as inappropriate language, due to the presence of the word "prick" in its name. As a spirit, it has circular eyes with a black outline and a black line bisecting its pupils, that change color depending on its disposition. 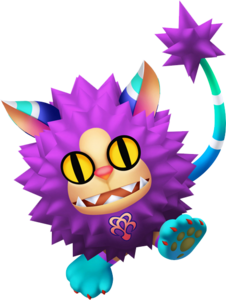 A spiky purple mane covers most of its body, in addition to a peach colored face with a pink nose and a mouth lined with sharp pointed teeth. The Spirit Dream Eater symbol is located on its mane. Its ears and tail are striped with blue, cyan, and white. Its purple legs have cyan paws with red nails and yellow pads. The tail has a spiky tuft of purple fur. Both its body and tail fur can be changed color using Paint Guns. 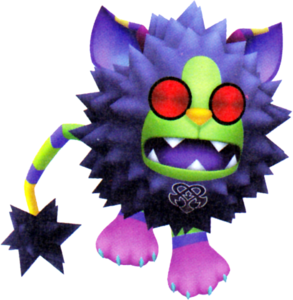 As a Nightmare, it has circular red eyes, and a spiky dark purple mane covers most of its body, in addition to a green colored face with a yellow nose and a mouth lined with sharp pointed teeth. The Nightmare Dream Eater symbol is located on the bottom of its mane. Its ears and tail are striped with pink, yellow, and purple. Its green legs have purple paws with blue nails. The tail has a spiky tuft of dark purple fur. ↑ 1.0 1.1 1.2 1.3 Becomes available after unlocking Secret: Green at B-6. ↑ 2.0 2.1 Becomes available when in Intellectual disposition. The Pricklemane Recipe can be purchased from the Moogle Shop for 50 munny. The Pricklemane can be created through five different recipes. The third recipe is a rank B recipe that has a 40% chance of transforming from Tama Sheep. The fifth recipe is a rank S recipe that has an 80% chance of success.